The next Donkey Kong Country needs to chill a little longer before serving. 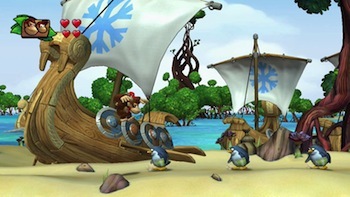 Donkey Kong Country: Tropical Freeze will not hit stores until February, 2014. Nintendo president Satoru Iwata announced the delay during this morning's Nintendo Direct address. "In order to deliver the optimum gaming experience, we need a little more time for development of this title," said Iwata. "We would like to apologize for this delay, and hope you understand." Tropical Freeze, Retro's Wii U follow-up to Donkey Kong Country Returns, was previously on track to come out December 6. Tropical Freeze will reincorporate the extended Kong family into the series with the return of Dixie Kong.